Corporations are the dominant force in modern life, surpassing even church and state. The largest are richer than entire nations, and courts have given these entities more rights than people. To many Americans, corporate power seems out of control. According to a Business Week/Harris poll released in September 2000, 82 percent of those surveyed agreed that “business has too much power over too many aspects of our lives.” And the recent revelations of corporate scandal and political influence have only added to such concerns. Where did this powerful institution come from? How did it get so much power? 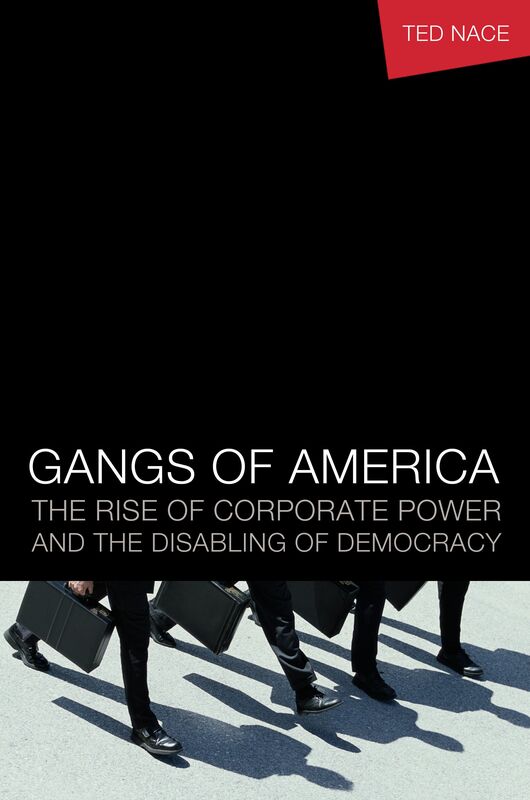 In Gangs of America: The Rise of Corporate Power and the Disabling of Democracy, author Ted Nace probes the roots of corporate power, finding answers in surprising places. A key revelation of the book is the wariness of the Founding Fathers toward corporations. That wariness was shaped by rampant abuses on the part of British corporations such as the Virginia Company, whose ill-treatment killed thousands of women and children on forced-labor tobacco plantations, and the East India Company, whose attempt to monopolize American commodities led to the merchant-led rebellion known as the Boston Tea Party. Because of such attitudes, the word corporation does not appear once in the United States Constitution. At the Constitutional Convention, all proposals to include corporations in that document were voted down by delegates. Corporate attorneys persisted in seeking legal protections for their clients by means of sympathetic court rulings, but until the Civil War such attempts largely failed. After the Civil War, the tide quickly turned, as lobbyists secured key changes in corporate law and as corporate attorneys won a series of decisions from an increasingly pro-corporate Supreme Court. Nace recounts the key figures who engineered the “corporate bill of rights,” in particular two brilliant strategists: railroad baron Tom Scott and Supreme Court Justice Stephen Field. The book explores in depth the bizarre intrigues that resulted in the infamous “corporations are persons” ruling of 1886, and how that ruling affected the subsequent development of Supreme Court doctrine. According to Nace, that optimistic view was dashed in the final decades of the twentieth century, as Big Business mounted a remarkable comeback. The corporate political resurgence began with a 1971 memorandum written by Lewis Powell, Jr., shortly before Powell was appointed to the Supreme Court by Richard Nixon. In the memorandum, Powell urged corporate America to apply its full organizational and strategic resources to politics, a course of action that proved highly successful. Gangs of America describes the expansion of corporate legal empowerment onto the global stage through international agreements such as the North American Free Trade Agreement, which boosted the legal powers of corporations to the level of sovereign nations. The book pays special attention to recent events, including campaign finance reform, the financial scandals of 2002, and the growing movement to redefine the corporation and limit corporate power. Ted Nace worked as a researcher on electric utility policy for the Environmental Defense Fund and as staff director of the Dakota Resource Council, a grassroots group seeking to protect farms and ranches from strip mines and other energy projects. In 1985, he founded Peachpit Press, the world’s leading publisher of books on computer graphics and desktop publishing. After selling Peachpit Press to British publishing conglomerate Pearson, Nace felt driven to understand the historical roots of corporate political power. Gangs of America, the result of that quest, features Nace’s engaging, personal, and complex voicethat of a writer, a businessman, and an activist.